Oscar Night is the jewel in the crown of Hollywood's glittering award season, which is the best and brightest gathering to celebrate the most accomplished creative talents. 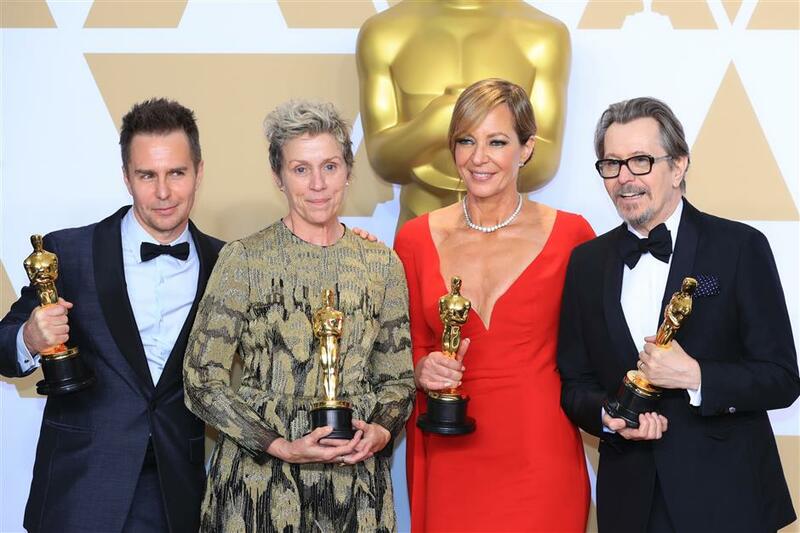 From left: Sam Rockwell, Frances McDormand, Allison Janney and Gary Oldman pose with their awards at the 90th Annual Academy Awards in Los Angeles, USA, on March 4, 2018. Oscar Night is the jewel in the crown of Hollywood's glittering award season, which is the best and brightest gathering to celebrate the industry's most accomplished creative talents. This year, the jewel shined on Sunday. Before the ceremony began, the red carpet was awash with Hollywood's biggest stars, as attendees made their way into the Dolby Auditorium for the 90th Academy Award Celebrations. The Shape of Water was the big winner Sunday night, raking in four Oscars, including Best Production Design, Best Score, as well as Best Director and Best Picture, the Academy's highest accolades. The Best Picture race has been neck-in-neck for weeks, but the Academy finally awarded it to Del Toro's romantic, retro-Noir creature feature, The Shape of Water. "I am an immigrant. The greatest thing our art does and our industry does is to erase the lines in the sand. We should continue doing that when the world tells us to make them deeper," Del Toro said from the podium. Dunkirk was in the second place, with a respectable three technical Oscars, including Best Editing, Best Sound Editing and Best Sound Mixing. Hopes had been high that I Tanya's Tatiana Riegel would be the first woman to win Best Editor, but Dunkirk's Lee Smith snapped it up instead. Dunkirk's Sound Mixing team was composed by Mark Weingarten, Gary Rizzo and Gregg Landaker, who announced his retirement after having been engaged in 207 films. The focus throughout the evening was a growing sense of support in immigrants and minorities. Meanwhile, female empowerment also came strong as many Hollywood's leading women took the stage to promise that the era of the casting couch was well and truly over. Jimmy Kimmel kicked things off with a joke about the gender of the Academy's signature Oscar statue and the lamentable fact that women had only directed 11 percent of Hollywood films. As widely predicted by industry press, Frances McDormand completed her basket of trophies by adding the Best Actress Oscar to her Golden Globe, BAFTA and SAG awards, putting to rest speculation of a Sally Hawkins Hail Mary win. McDormand extorted all the women nominees and winners to stand up from their seats to get the recognition they deserved. "Are women just trending? No! Are African Americans just trending? NO! It all changes now!" The Best Supporting Actress might have gone Laurie Metcalf's way for her smothering but sympathetic mom in Lady Bird, had not Allison Janney got under the voters' skins early on with her brutally raw, no-holds-barred performance of a viper-tongued, abusive mother in I, Tanya. Though Best Adapted Screenplay could have gone to any one of the nominees, prevailing wisdom predicted a win for James Ivory, who, at 89, has been nominated for an Oscar multiple times, but never brought home the statue. This time he finally got the gold for Call Me By Your Name. Though all the nominees for Best Cinematography were superb, Roger Deakins' Blade Runner 2049 seemed to have an edge from the beginning. Deakins has been recognized with 13 Oscar nominations but no wins. This was finally his year when Blade Runner 2049 took home the gold. Original Screenplay was another race that was neck-and-neck, where a surprise win could be in the cards. Asian-centric bio-pic, The Big Sick, won Best First Screenplay at the Spirit Awards last night, as did Lady Bird for Best Screenplay, but many predicted 3 Bills was the one to beat after nabbing the Golden Globes trophy. All were shut out by a surprising win by Jordan Peele's Get Out, making history as the first African American to win this award. When he took to the press stage, Peele was confronted by a sea of reporters holding numbered signs (corresponding with their seats). He quipped, "I feel like I'm about to be auctioned!" He went on saying that "I must have given up on this project at least 20 times, believing I could never get a film like this made. This award is a testament to not giving up." For Best Animated Film, Coco was born again with a gold statuette after years of intense creative endeavor by Lee Unkrich and his team at Pixar. Unkrich told that "This is the culmination of six years of our lives. But it was worth it to bring such an authentic story that is genuinely respectful of Mexican culture to the screen." Five NBA championships, 18-time All-Star and first-time Oscar nominee, Kobe Bryant rushed the basket and scored big with Dear Basketball, winning the Best Animated Short Film category along with fellow filmmaker, Glen Keane. "Honestly, this means more to me than the NBA Championship," Bryant confessed with a grin.